The ubiquitous Bedford OB / Duple Vista of course, but GWV 101 is interesting in that it spent its entire operational life with Leather’s Coaches of Maiden Bradley, Wiltshire. Leather’s was one of the last surviving traditional village bus operators with origins as horse-drawn hauliers. Basil Leather was still the proprietor when he bought GWV 101 new in 1951. He sold the business to Donald Newbury, one of his drivers, in 1962, and it subsequently passed to Don’s son-in-law and daughter, Len and Sylvia Cooper, but the fleetname of Leather’s Coaches was retained throughout. In latter years GWV 101 was only used on special occasions. On 17th October 1992 it operated, by prior arrangement, on the “small bus” duty on Leather’s bus service between Gillingham, Frome, and Warminster. 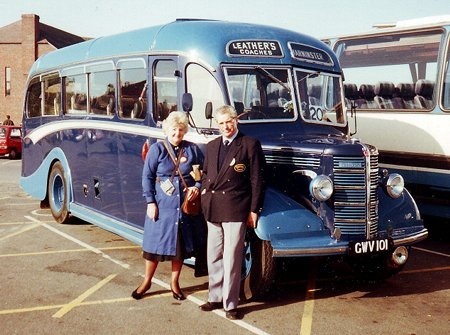 Len and Sylvia were driver and conductress for the day, and are seen here with the coach after arrival in Warminster. Len and Sylvia retired in January 1998 but kept GWV 101 as a preserved vehicle. Yet another pristine example of this most legendary model. I absolutely loved them for their utter honesty – economical, gutsy beyond belief, handsome, and the providers of some of the finest acoustic delights one could wish for. I’m sure many, like me, simply drooled over the pure but sharp "top of the scale" whining and howling in the lower three gears – occasionally including a forgivable "back fire" – before settling into the trolleybus like top gear. Thereafter one would sail along with a bit of timpani, not annoying in the least, from the twittering rear springs that very one of these little gems displayed. Oh, for a trip to the seaside in one right now, or perhaps a ride to Town in one of the utility service bus variants whose unbelievable performance when often grossly overloaded was yet another legend. I make no apology for this glowing accolade – our little heroes richly deserve it. Still in a lovely condition. I saw it on Wednesday 25th July at a gathering at Longbridge Deverill, Wiltshire. Chris, I’ll ‘second’ every word you’ve said. The OB sound still sends shivers up my spine. The only other things to do that are the sounds of a straight cut geared manual AEC box and a fly past by the Battle of Britain Memorial Flight! I have a special soft spot Eric for one little Bedford in particular – this was in the RAF and was 00 AC 62. It was stationed, like me, at RAF Patrington and for some odd reason, especially at a top secret establishment, was driven usually by a civilian driver, Sam, who lived nearby in the Village. Our daily journeys to and from shifts at the radar site, some five miles away at Holmpton, were on board Bedford QL lorries (acoustic divas in their own right), or brand new Bedford SB petrol/Mulliner buses (coach, service, convertible to ambulance, Bedford 4 x 2, Mulliners Ltd.^) or the little star of the Station. Sam drove it exceptionally well with skill and affection and, as in many other cases, why on Earth didn’t I take some pictures. I can though still picture those well worn light green canvas type seats. To avoid any confusion, our living quarters at Patrington Haven are now a rather fine holiday home village, and the Radar site at Holmpton is now the National Defence Archive and is open to the Public – but you will have to just imagine those glorious Bedford sounds as you make you way there by car !! And for those such as myself who live a long way from the nearest active OB there’s always EFE’s 1/76 scale model of this very vehicle. Haven’t bought it yet due to financial constraints – I also want one of EFE’s Silver Star double-deckers to go with it! Looking at the picture I suddenly realised that it’s been 45 years since I last rode on one of these lovely machines in ordinary everyday service – during a two week holiday in Cornwall in 1967 I rode on them at least twice each day on Hawkey of Wadebridge’s services to the coast. Good times. I’ve never seen a bus empty so fast as when stationed in Nicosia in 1957 the driver of our Mulliner SB admitted he hadn’t done a bomb check that morning! I can still remember the ride I made with my Dad to go on holiday in 1951 to Bridlington from Bradford. The coach was a Bedford OB on a private hire trip from a local textile mill. My sister, who suffered travel sickness and my Mum went by train but I jumped at the idea of going by coach. As Chris Y says the music from the Bedford transmission was something never to forget. Happy days.